Spring is now here! It's still chilly where I am, but I could not wait to take one of my recent outfit inspirations and turn it into a reality. 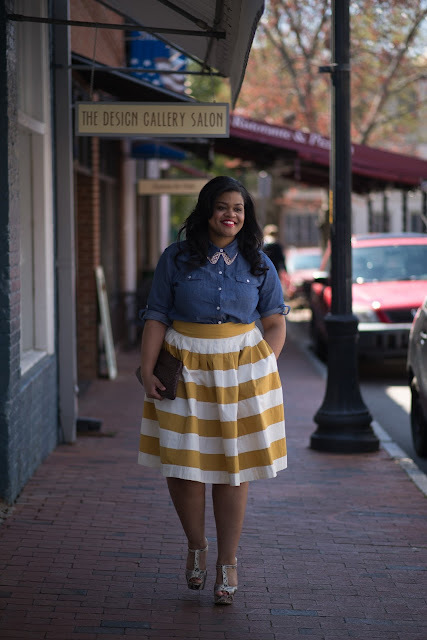 The idea of the outfit centered around a beautiful striped skirt from eShakti. 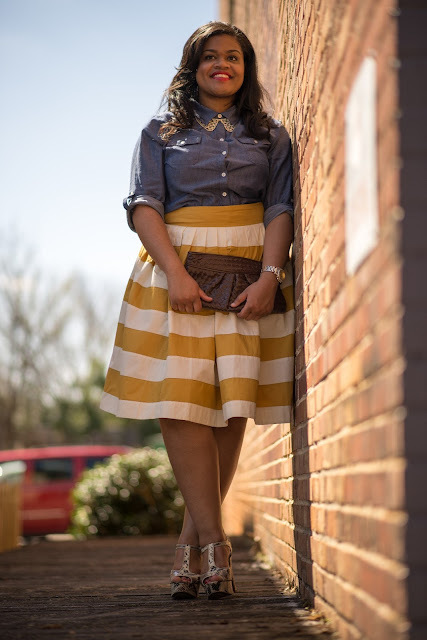 This skirt was recently sent to me to review from eShakti's Spring Collection. 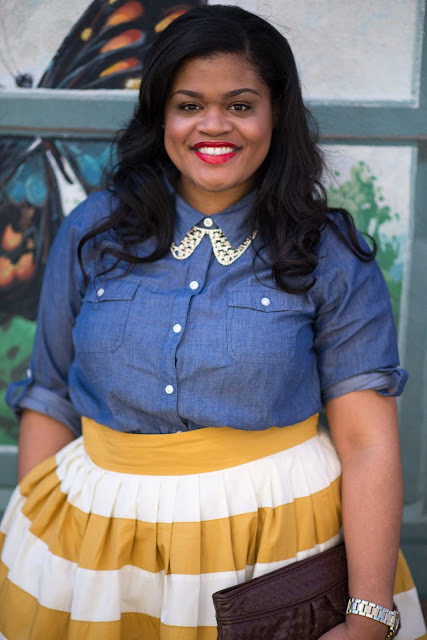 If you aren't familiar with eShakti, be sure to check out my last review here. The reason I chose this striped skirt was because I was inspired when I saw Garner Style rock the black and white version. 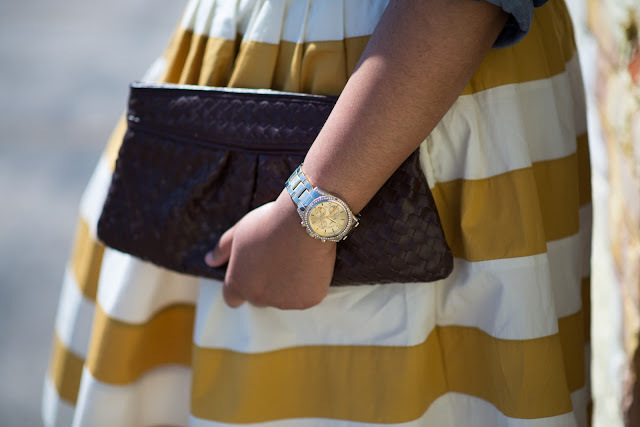 I decided to go with the mustard and cream because mustard is one of my favorite colors and can be worn with a variety of colors and prints. My experience in ordering this skirt was wonderful for several reasons, including very fast shipping. I received the skirt in less than two weeks. This is record timing because I actually chose to customize the skirt. eShakti offers customization for most of their dresses and skirts. They can be customized to fit above, at or below the knee. I chose to have it customized to fit at the knee. I love how it turned out as well as the quality. Most of all, it again has pockets, which are a girl like me's dream in dresses and skirts. All in all, this was another wonderful experience! Lastly, you may notice a great improvement in the quality of my photos! This is thanks to my photographer, A Collected Gentleman. He is a style blogger as well as a photographer. Be sure to check out more of his work here. For information on my hair, please click here. What do you think of the look? Are you rocking stripes this Spring? This makes me want a skirt. I love knee length! Loving the photography as well. Gorgeous outfit! I am loving your skirt, great color. you look so cute, love that skirt! can't wait for my dress i chose to come in! Love this, and I love the skirt. I may need to hit up this site! I have a hard time finding skirt that stop at the prefect length. Beautiful colors! Love the skirt! Thanks! I really think you would love this skirt and knowing you, you would style it beautifully. Just had a thought... I wonder if this would be cute with a graphic tee. No? Thanks Quanah! I appreciate you stopping by! Thanks Janessa! I usually prefer dresses, but this was a nice change. You look so fab and that skirt is too cute! Love your hair! Wait min...whad I miss! LOL You do look absolutely fab! Thanks lady! I appreciate you stopping by. You may really enjoy their items! LOL! Girl, I don't know what she is talking about. Thanks Tori! OMG! This look is stunning on you! LOVe the skirt...and the red lips are the perfect finishing touch! ahh you look fab! love the skirt! totally looking lovely in this outfit!! so chic, dear!! You look absolutely wonderful in this.